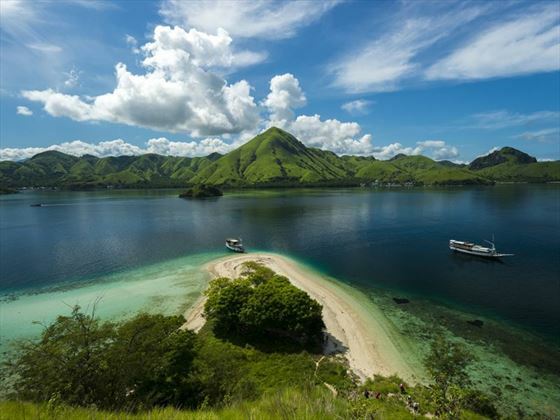 Discover a blissful oasis of breath-taking scenery, rich, ancient culture and a magnificent diversity of native wildlife on an incredible 10-day tour of Indonesia’s ‘Flower Island’ and Komodo National Park, promising to leave memories you will cherish forever. Indonesia’s spectacular islands are scattered like gems across the Indian Ocean, each offering a little pocket of tropical paradise where soaring volcanoes overlook charming seaside towns, and ancient indigenous tribes keep their traditions deep within the luscious rainforest valleys. Starting and ending in the quaint fishing town of Labuan Bajo, a well-known gateway to Komodo Island, we think this tour is ideally suited to those looking for an escape into some of the planet’s most dramatic, unspoiled scenery – set completely away from the modern world. 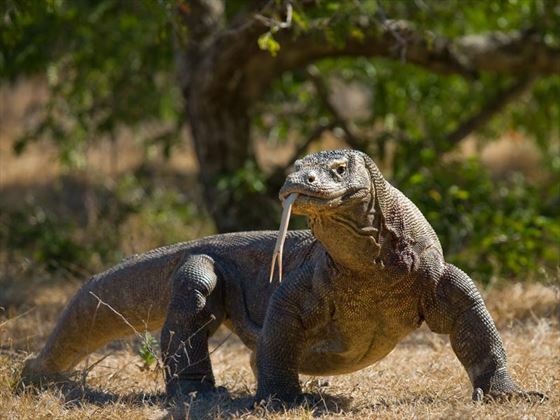 You’ll spend three days soaking up the outstanding backdrop of powdery pink, black and white sand beaches, sparkling azure sea and a magnificent array of wildlife in Komodo National Park, drawing a focus on the prehistoric, gigantic komodo dragons. There will be plentiful opportunity to snorkel and swim around the islands’ underwater paradises in search of sea turtles, manta rays and tropical reef fish before heading to Flores. Hike deep into the rainforest to spend a night in an ancient tribal village named Wae Rebo, where you’ll join the locals for a welcome ceremony, home-cooked meal and cultural performance, before heading to the picturesque, mountain-fed hot springs of Bajawa to unwind. From here, you’ll enjoy plenty more opportunities to immerse in the fascinating culture and sublime scenery of the region with a tour of three villages in Ngada, a picturesque drive along the scenic coast and stunning rice paddies to Moni, and a magnificent sunrise trek to Mt Kelimutu before your Indonesian adventure draws to an end. Upon arrival in Flores, you will take a transfer to the sleepy fishing town of Labuan Bajo, well-known as the gateway to Komodo Island. You’ll meet with your tour leader and travel group for a welcome meeting at 6pm, so you can enjoy some time beforehand getting acquainted with the area – we recommend taking a stroll along the gorgeous waterfront, stopping off in a quaint café or bar along the way. After breakfast, you’ll take a two-hour boat journey to Padar, the third largest island within Komodo National Park. 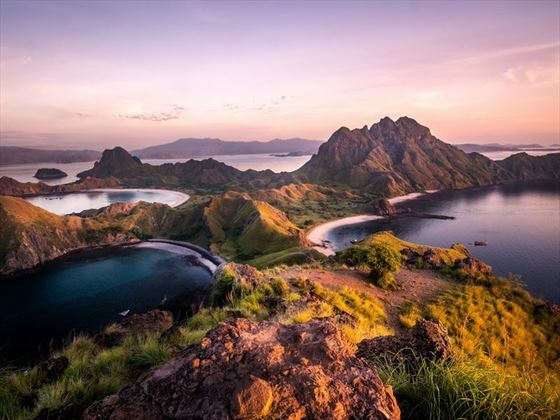 Enjoy a brisk morning hike to a stunning view point, keeping an eye out for geckos, green turtles and other reptiles along the way; the rewarding panoramic views of Padar’s luscious terrain and tri-coloured beaches will take your breath away at the end of the hike. Return to the boat for an on-board lunch as you sail to the spectacular Pink Beach which owes its blush tone to red coral within its clear, shallow waters. Spend some time swimming and snorkelling among the vibrant coral reefs and marine life before returning to the boat mid-afternoon for the short journey to Komodo Island, where you will take a fascinating two-hour photography safari in search of the gigantic komodo dragons. You’ll stay on the boat overnight, moored off the coast of Kalong Island with basic dormitory-style accommodation. You will spend the entirety of today exploring and snorkelling Indonesia’s underwater paradise. Depart early for the small, jellybean-shaped island of Taka Makassar, arriving at around 8am. The waters here are shallow, clear and home to an abundance of beautiful corals and majestic sea turtles. Return to the boat at around 9:30am and depart for Manta Point, where you’ll enjoy plenty of time swimming, snorkelling and keeping a keen eye out for manta rays - You’ll also be able to see a magnificent variety of hard and soft corals, tropical reef fish and turtles. Return to the boat for lunch and head back to your hotel in Labuan Bajo, taking around 3 hours. 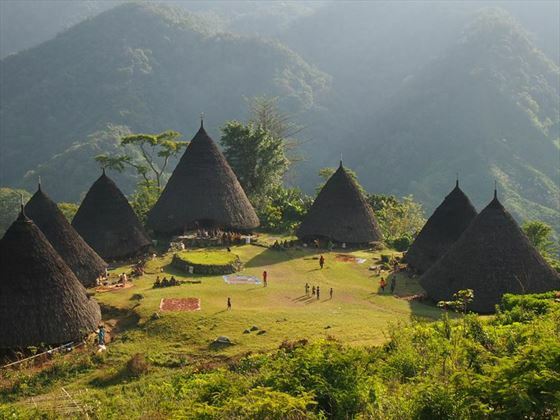 Today will be spent travelling to Wae Rebo, an ancient tribal village secluded in the centre of a lush rainforest valley adorned by mountains, where you will immerse in the local life with a fascinating homestay. Before you depart this morning, you’ll need to pack a small overnight bag with your essentials, as you will not be able to take large luggage with you. 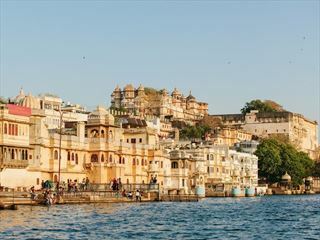 Travel by private minivan to Dintor (6 hours), where you will stow your bags and enjoy lunch. Continue a further 20 minutes via minivan, from where you will take a three-hour trek to Wae Rebo – comfortable walking shoes are a must, and a porter may be arranged at an additional cost. Upon arrival, the local villagers will warmly greet the group with a welcome ceremony. Sit down to a dinner of traditional, freshly prepared meal and sample some special Wae Rebo coffee; If weather conditions are good, you may even be treated to a special cultural performance too. Wake up to the fresh mountain air and the sounds of birds singing to enjoy an early breakfast in the village. Afterwards, you will trek back through the rainforest and take a short bus ride to Dintor, where you will collect your larger bag, take a shower and enjoy lunch. Afterwards, travel by private minivan to Ruteng, taking around 4 to 5 hours with a stop along the way to visit the spectacular spiralling rice fields of Cancar. After breakfast, take a 4-5 hour journey to Bajawa via private minivan, stopping along the way at a local family-run restaurant along the coast for lunch. As you approach Bajawa, the majestic peaks of Mount Inerie will start to emerge on the horizon – this stratovolcano is one of the highest points on Flores and warms the water that pours into the Mengeruda Hot Springs. On arrival in Bajawa, take time to unwind in the soothing hot spring waters, said to hold medicinal properties, surrounded by picturesque waterfalls and overhanging trees. Later, head to your hotel in Bajawa for an overnight stay. In the morning, you will travel around 45 minutes by private minivan to Bena, a small village in Ngada known for its impressive stone formations and ancestral shrines. Follow your tour leader on a guided tour of the village, wandering through the magnificent structures and tall thatched huts, before taking some time to meet the locals and learn about their customs. You will then spend a couple of hours trekking through the surrounding countryside to visit two more Ngada villages, where you’ll gain a deeper understanding of the rich, local culture. Return to Bajawa for the night. After breakfast, set out on a four-hour drive to Moni, stopping for photos along the scenic coast. Picturesque, remote and surrounded by breath-taking rice paddies, Moni is also located at the foot of Mt Kelimutu, famous for its stunning tri-coloured volcanic lakes. Arrive at the eco lodge, and enjoy an afternoon relaxing and soaking up the tranquil surrounds at leisure – we recommend an early night, as you will be trekking to Mt Kelimutu early in the morning. 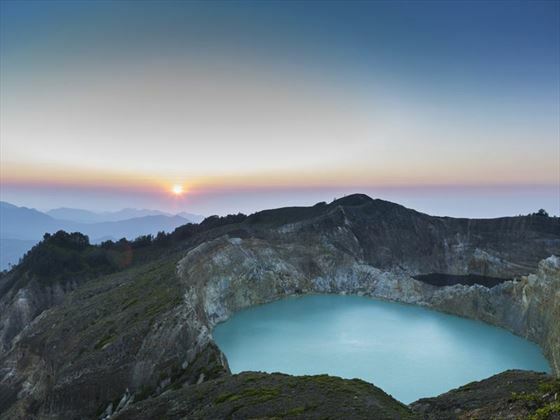 Today begins with a rewarding sunrise trek to Mt Kelimutu, showcasing spectacular views of the vibrant green, blue and red crater lakes from the peak. Start with a 30-minute drive to the mountain, followed by a 30 to 40-minute walk to the crater viewpoints. After taking some time to admire the views and capture some fantastic photos, you’ll return to the lodge for breakfast before heading to Labuan Bajo (a two-hour drive to Ende Airport and a 50-minute flight). Transfer to your hotel, freshen up and spend some time at leisure before perhaps enjoying a final Indonesian feast with the group as your trip comes to an end. After breakfast, bid a fond farewell to your Indonesian adventure as your trip of a lifetime draws to an end. Spend some time at leisure around the city before heading to the airport in plenty of time for your flight. 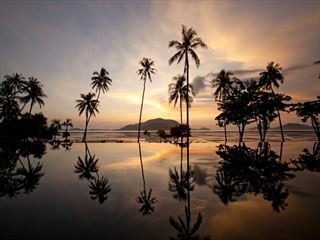 The Oberoi Lombok exudes modern luxury, personal service and natural beauty. 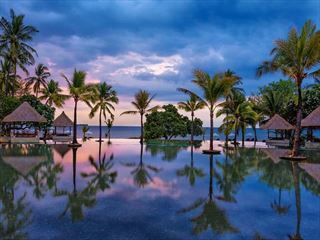 Ideal for families and romantic getaways alike, the Oberoi Lombok offers an array of fines dining and recreational facilities, with fabulous snorkelling and picnic trips to the Gili Islands, just minutes away by the resorts speedboat.